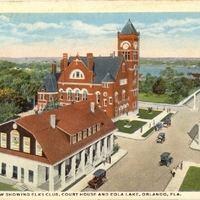 Postcard showing the Victorian-style Orange County Courthouse with Lake Eola in the background. The streets are Main Street (present-day Magnolia Avenue) and Central Avenue (present-day Central Boulevard). The Orange County Courthouse was constructed in 1892 and its cornerstone was laid on January 15, 1892. The architect was A. S. Wagner and the general contractor was the W. C. Green Company of Chicago, Illinois. The red brick, three-story building, which cost $57,000, was built in the Gothic Revival style with a 80-foot high clock tower. The clock and bell were provided for by W. C. Sherman, a local businessman who raised several thousand dollars for the project. The clock mechanism was manufactured by Dent, London, founded by Edward John Dent, the company which made the Big Ben clock movement in London, England. The bell in the tower weighed 1,500 pounds, was tuned "F", was selected by local musician Harry Newell, and as of 2011, is on display in the lobby of the Orange County Courthouse. The Orange County Courthouse occupied the building until 1927, when a new primary courthouse was constructed next door. Afterward, it was used for Orange County offices. On July 30, 1957, the building was condemned and then demolished on December 30, 1957. A new Orange County Courthouse Annex building was constructed on the site. In the late 1990s, the Courthouse Annex was demolished and replaced with an urban park called Heritage Square, owned by Orange County. The gray building on the right is the McEwan Clinic, located at 100 East Central Boulevard, which was constructed in 1911. The original owner was Dr. John Singer McEwan. The building was designed to be Orlando's first public hospital. A third story was added circa 1920 to make a total of twenty hospital rooms. Apart from being a hospital and clinic, it was also the Florida Public Service Corporation, later the office of the Florida Gas Company, clothing stores (Artistry), and a 7-Eleven. As of 2011, it is the Central Station Bar. Across the Main Street from the Courthouse is the Orlando Lawn Bowling Clubs grounds. Original 5.5 x 3.5 inch color postcard: C. T. American Art: Private Collection of Thomas Cook. Digital reproduction of original 5.5 x 3.5 inch color postcard: C.T. American Art. Originally published by C. T. American Art . Copyright to this resource is held by C. T. American Art and is provided here by RICHES of Central Florida for educational purposes only. "Elks History Project." The Benevolent and Protective Order of Elks of the United States of America. http://www.elks.org/history/. "Orange County Courthouse." Ninth Judicial Circuit Court of Florida. http://www.ninthcircuit.org/about/courthouses/orange/. 7-Eleven; Atistry; Central Avenue; Central Blvd. ; Central Boulevard; Central Bv. ; Central Station Bar; Cook, Thomas; Dent, Edward John; Downtown; Downtown Orlando; Florida Gas Co.; Florida Gas Company; Florida Public Service Corp.; Florida Public Service Corporation; Green, W. C.; Lake Eola; Magnolia Ave.; Magnolia Avenue; Main St.; Main Street; McEwan Clinic; McEwan Sanitarium; McEwan, John Singer; Newell, Harry; Orange County Courthouse; Orlando Lawn Bowling Club; Sherman, W. C.; W. C. Green Co.; W. C. Green Company; Wagner, A. S.
“Bird's Eye View Showing Elks Club, Court House and Eola Lake Postcard.” RICHES of Central Florida accessed April 24, 2019, https://richesmi.cah.ucf.edu/omeka/items/show/974.